We must acknowledge that some farm breeds are better looking than others. Kate Green suggests the most handsome creatures to enhance your landscape. We have to thank the enterprising William Cook of Orpington, Kent, for the Queen Mother’s favourite chicken-she had a flock at Sandringham. Mr Cook started breeding chickens as a teenager and went on to become a prolific poultry journalist and purveyor of fattening powders. His first Orpington, a black Minorca-black Plymouth Rock cross pullet, a prize-winner at the 1886 Crystal Palace Poultry Show, was big, black and very fluffy-other shades, including the most famous buff, came later. The Dowager Duchess of Devonshire is another devotee of the matronly fowl; her Buff Orpingtons have great presence and flounce importantly around the gardens and car park at Chatsworth. The speckled Sussex, in contrast to the fancy Orpington, has an endearingly neat, cuddly silhouette and looks much prettier meandering through the daffodils in the orchard than larger Continental breeds. 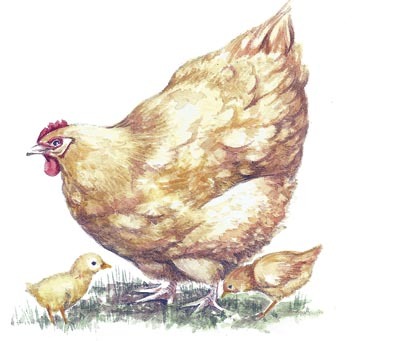 It’s the earliest variety of Sussex chicken, makes a good table bird and children’s pet and also comes in bantam form. 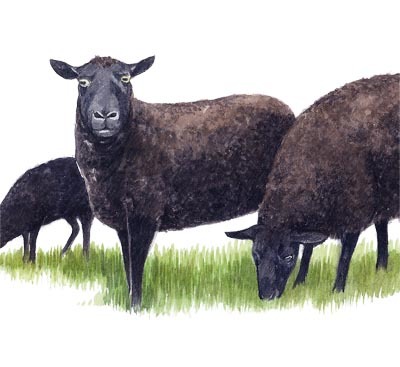 Black sheep-in every sense-have a special magnetism and the sight of the Jervoise family’s flock dotted around the parkland at Herriard never fails to delight as you drive from Basingstoke to Alton. 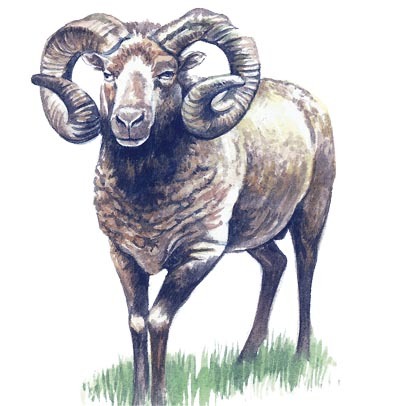 The breed was introduced to this part of Hampshire by Viscount Camrose, publisher of The War Illustrated, who bought the neighbouring Hackwood Park estate in 1935-the sheep were a nod to his Merthyr Tydfil origins and he was reputed to have a suit made each year from their wool. The great thing is that, although black Welsh mountains look tremendously exotic with their curly horns (the rams) and mystical green-eyed stares, they’re actually one of the most low-maintenance breeds: tough, healthy, independent when lambing, good at herbage control in parkland and producers of excellent meat. of-gravity waddle is more Charlie Chaplin than Swan Lake-but the Orpington has a certain je ne sais quoi. Like the eponymous hen, it was developed by William Cook, who cross-bred the long-necked Indian runner duck with Aylesburys, Rouens and Cayugas. 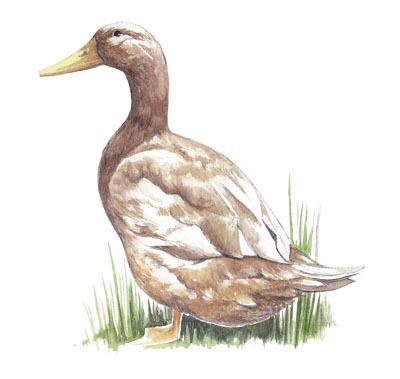 The Orpington duck comes in a variety of shades, the pretty golden-buff being the most usual; it doesn’t show the dirt like a white duck does, but the snag for breeders is that colouring can be erratic. Omlet, the fowl-house company, gives it five stars for looks. sidering that they only require about half the space and food of red deer. 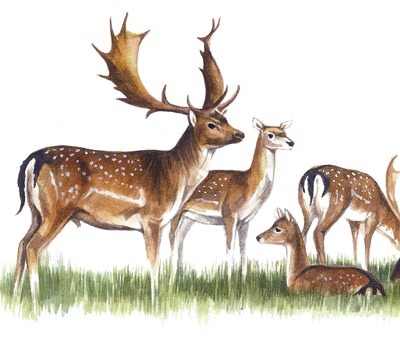 Fallow deer, which came to Britain with the Normans and were considered a prestigious addition to ducal estates, are also prettier, even if their meat tastes slightly milder. Their pale throats and spotted backs are reminiscent of ancient hunting scenes and they make a magical sight in early-morning sunlight, especially against a backdrop of ancient trees such as at Petworth or Burghley. The graceful golden Guernsey-the Brigitte Bardot of the goat world-has a flowing, honey-coloured coat and can thrive in a small space. 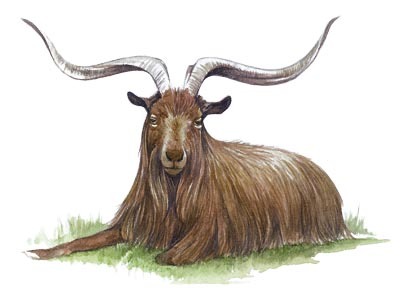 Obviously, billy-goat behaviour and elegance are rarely uttered in the same breath, despite the magnificence of this beast (right), but a couple of biddable nannies would make a charming addition to an odd pocket of ground near the house or in the farmyard. The prettiest of pigs-less hefty than a Gloucestershire Old Spot, with more gravitas than a Tamworth and a nicer-shaped snout than a Berkshire-the friendly plum-pudding pig, with its rusty colouring and black splodges (the piglets are adorable), is considered both productive and attractive by the leading garden designer Bunny Guinness, who has them adorning her elegant Cambridgeshire smallholding. 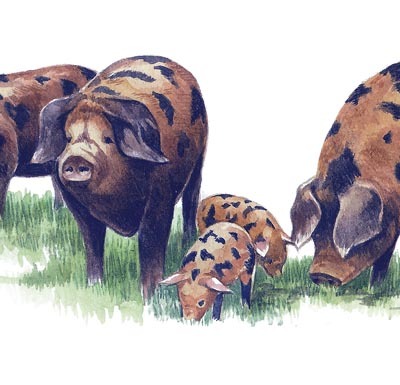 The OSB’s bloodlines-which include Clarence, Alexander, Alistair (male) and Clarissa, Gertrude and Sybil (female)-have a grandiose ring about them, but it took considerable dedication by breeders to save the pig from extinction in the 1940s. It’s now classified ‘minority’ by the RBST. The magnificent English longhorn is perhaps the ultimate in beauty among farm animals. Its presence, such as in parkland at Elizabethan Hardwick Hall in Derbyshire or grazing beside the River Findhorn on the Logie estate in Morayshire, can transform the landscape. 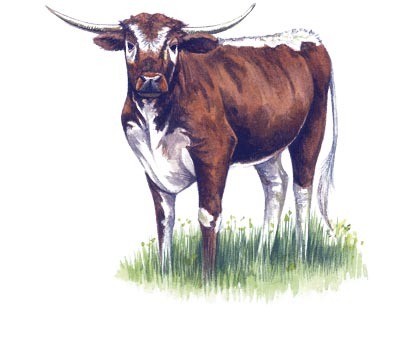 Its noble demeanour was the subject of numerous agriculture paintings in the 18th century and it was Britain’s most prolific dairy cow until after the Second World War, when Continental breeds took over; however, renewed enthusiasm means it has become an RBST success story. The horns, slivers of which once served as a poor man’s glass, can stick out sideways or curl round the mouth, but the curve must be forward. The rich, red brindle-roan colouring-like a paint stippling-effect-is considered the breed ideal. it peers out from under its fringe, gives the impression that it’s got a sense of humour, rather like a bovine Just William. Probably the only cow that can be genuinely described as a tourist attraction, the Highland is, happily, no longer the sole preserve of Scotland. 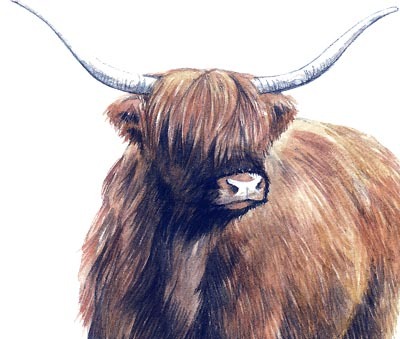 There’s a major herd on the Isle of Wight, owned by farmer Michael Poland, a Highland Cattle Club of Wales and many other landowners and smallholders are falling in love with a low-maintenance cow that’s uncomplaining and full of character.